In the hands of Disney's extraordinary animators, Lewis Carroll's immortal literary classic comes to life like never before! The surprises begin when a daydreaming Alice encounters a White Rabbit who is frantically running late. She chases him and falls into the magical, madcap world of Wonderland with its kaleidoscope of off-the-wall characters -- including Tweedledee and Tweedledum, the Cheshire Cat, and the manic Mad Hatter, who invites her to a memorable tea party! The crowning confrontation begins when Alice meets the notorious Queen of Hearts and her enchanted deck of playing cards. Tricked into a curious game of croquet, Alice, and her patience, end up on trial. Is there no escape from this whimsical escapade? Filled with fantasy and topsy-turvy fun, Alice In Wonderland is teeming with spectacular songs and astounding animation in the highest Disney tradition! Academy Awards: Nominated for Best Musical Score, 1952. DVD: Standard 1.33:1; audio English DD 5.0, Spanish Digital Mono; subtitles none; closed-captioned; single side - dual layer; 27 chapters; rated G; 75 min. ; $29.99; street date 7/5/00. Supplements: Alice In Wonderland DVD Storybook; Alice In Wonderland Trivia Game; "Operation Wonderland" Featurette; "The Unbirthday Song" Sing-Along; "All In The Golden Afternoon" Sing-Along; Theatrical Trailer. Perhaps the folks at Disney have a perverse sense of humor. Why else would they release two of their least-liked animated films on DVD on the same day? For whatever reason, that's exactly what they did - and on Independence Day, as well! Both Robin Hood and Alice In Wonderland hit the streets that day, and both are often regarded as among the worst Disney has to offer. Perhaps not coincidentally, these two films feature some of the weakest plots to be found in Disney animation. Neither has any real storyline; instead, they essentially combine various largely unrelated sequences and hope we dig the result. As far as I'm concerned, that's where the similarities between RH and Alice stop. I fully agree with the critics of RH; it really is a lackluster, cheaply-made mess. Alice, on the other hand, is where I don't understand the poor reception. Not only do I disagree with the extreme negative assessments, but I actually find it to be one of Disney's best films; Alice differs from the typical fare, which may be one reason for its less-than-welcome reception, but that's part of the reason I like it so much. Because I never read the Lewis Carroll books, I can't provide a direct comparison of how well Disney adapted the tales. Frankly, I believe such examinations are fairly useless. I don't care if a movie perfectly resembles its source or if it seems radically different; I judge the film on its own, not how well it duplicates other material. Nonetheless, I believe many of the criticisms of Alice stem from the fact that Disney did too much to tame the books' anarchic spirit. That said, the movie stands as one of Disney's most irreverent and least "heart-warming" films, at least for the era; I honestly think it seems ahead of its time in that it presented a more daring and glib exterior than we'd see until more recent pictures like Aladdin or Hercules. Is Alice consistently and completely successful in this regard? No, but it works more often than it doesn't. Some criticism - even from Walt himself - has been leveled at the character of Alice because she's a fairly cold and distant girl; she lacks the warmth and charm of other Disney heroines. Personally, I liked that fact. I don't want to see 100 characters who are all variations on the others. At the root, Alice really isn't much of a character; like many Disney protagonists, she's more of a spectator in her story than she is an active participant. However, it felt refreshing to have a character who seemed a bit cold and selfish; too much perfection gets old. I also was mildly happy to see a film that really didn't try to teach us many lessons. Throughout her adventure, Alice makes mistakes and gets into all sorts of predicaments, but she doesn't seem to learn much from these. If anything, the movie serves as an anti-lesson; Alice finds that she can fall into many binds but still emerge fine, as the whole thing was just a dream. One gets the feeling that after this fantasy, Alice hasn't changed one iota. Don't get me wrong: I think that movies that features morals or lessons are a positive thing. But every once in a while, it's nice to find one that doesn't tattoo us with "ways to live". Alice says that there are a lot of weird people in the world, you won't figure them out most of the time, but keep on trucking! Or something like that. Maybe I'm dense and I missed all sorts of lessons, but I find that Alice is more of an expression of the randomness of life. Not everything comes wrapped in a neat little bow, and Alice discovers this through the wildly inconsistent world she experiences. Rules make little sense and they change rapidly; you can try to figure them out, but you probably won't succeed. Just do your best and things will probably work out fine in the end. I'm officially babbling now, so I'll stop my theories on the "meaning" of Alice, other than to say I don't think it really has one. In any case, it works very well, as it packs in more diverse, clever and funny characters than probably any other Disney film. Surprisingly, however, it never seems like overkill. That's because it usually gives us the character, has some fun, then moves on to the next. Yes, some - like the Cheshire Cat or the mysterious White Rabbit - reappear from time to time, but even in those cases they remain in the background on later occasions; never do they wear out their welcomes. Alice doesn't provide the best animation Disney has to offer, but I thought the film provided a pleasing visual look. It differs from the classic appearance we associate with the Carroll books, but it really needed to do this or else the comparisons would have been even more withering. The movie probably could have looked less "cute", though in a perverse way, the sweet look of the characters makes their oddness stand out even more. Ultimately, I don't know how well Alice In Wonderland stands up to analysis, and if I were better acquainted with the original stories I may indeed find it less satisfying. At the current time, however, I really like the film. Alice provides an unusual and very entertaining Disney experience. 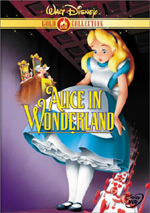 Alice In Wonderland appears in its original theatrical aspect ratio of approximately 1.33:1 on this single-sided, double-layered DVD; due to those dimensions, the image has not been enhanced for 16X9 televisions. Although it sports a few flaws, Alice generally looks quite splendid, and it virtually never belies its advanced age. Sharpness seems consistently strong, with most of the picture appearing nicely crisp and well-defined. On a few occasions, I encountered some mild softness during wide shots, but this remained infrequent and minor. Moir� effects were not an issue, but I did note a few examples of jagged edges, particularly during some scenes with a lot of camera movement. At no point does the print used appear to come from a nearly 50-year-old movie. It seems so clean as to be nearly flawless. I saw no signs of grain, speckles, scratches, hairs, spots or other problems, with a single exception: about halfway through the film, I detected some dirt on Alice's face for one frame. It was small enough that I had to reverse the film to examine it again, since I thought I might have imagined it. Nope, it's there, but it remains the only flaw I detected. Say what you will about Disney, but they take very good care of most of their animated films. Colors largely appear bold and vibrant, but a few inconsistencies appear. Fleshtones vary too much; the ostensibly human characters in the film can go from tan to fairly white to mildly pink throughout the movie. It's not a radical issue, but it was a moderate concern. I also noticed during a couple of scenes that used colored lighting that the hues looked a bit heavy and weren't as soft as they should have appeared. Black levels seemed nicely deep and dark, and shadow detail was fine. Contrast could be a minor issue, as sometimes white objects - such as the White Rabbit - appeared overly bright, but this was also a small concern. Note that my "B+" grade for Alice is not curved to take the age of the material into account; I'd give it the same mark if it were made yesterday. As such, although it has a few concerns, I nonetheless found Alice to look pretty terrific. Less scintillating is the film's newly-remixed Dolby Digital 5.0 soundtrack. I remain of two minds on the topic of multi-channel remixes from monaural sources. For the most part, I don't object to them because most of these stay pretty close to the original track; the extra channels may open up the sound somewhat, but they rarely try to reinvent the wheel. Also, much of the time the additional channels offer mainly music, which may have come from a stereo source; as such, the alterations seem logical and work fairly well. On the other hand, there's something to be said for sticking to the original material. The vast majority of monaural soundtracks exist in that state because of technological confinements from the period; yeah, some folks like Woody Allen still like mono, and Kubrick used it pretty late into his career as well, but since various multi-channel formats have become common, this happens very rarely. It's clear that most monaural movies aren't that way because of a conscious stylistic choice; they use that kind of audio because it was pretty much all that was available. Nonetheless, if the soundtracks were designed for mono, one could easily argue they should stay mono because alterations may corrupt the original plans. It doesn't seem likely that the multi-channel edition of a film will harm the material, but we can't say that with any certainty, and the potential for damage exists. All of these issues occurred to me as I listened to Alice In Wonderland because I found it to be an imperfect remix. To be sure, the 5.0 version doesn't try to go nuts with sonic expansion. In fact, the soundfield stays pretty close to the center. Virtually all singing and dialogue emerges from the middle speaker, and most effects remain there as well. It's largely the music that expands to (primarily) the forward right and left channels, with some light reinforcement of the tunes in the rears. At no point did I note any particularly discrete audio from the front or rear sides; the music in the forward speakers offered a mildly stereophonic impression, but I couldn't point out a single instance in which I heard a particular distinguishable sound from any of the side speakers. The surrounds definitely present no discrete audio, and one would be hard pressed to hear anything of note from them. Since this track is so mildly remixed, why do I maintain any objections? Because it features a slight thinness that's not present in the original version. Pretty much any soundtrack from 1951 will appear relatively thin and tinny to our ears; that's due to those nasty technological restrictions again. However, many the wan qualities of Alice seemed to result mainly from some "bleed through" problems; this occurs when the audio spreads to places where it wasn't supposed to go. The effects appear especially ill-defined in this regard; at times they'll seep through to all the front channels for no apparent reason. The music stays more clearly distinct and doesn't suffer from this concern as much, though the songs largely lack heft and are moderately bland. Dialogue can sound a bit rough at times, although it remains intelligible and clear. Clearly I didn't dislike the 5.0 soundtrack of Alice; my "C+" reflects some affection for it, and the remix does spread out the music nicely. However, the quality appears weaker than it should, and some "bleed-through" concerns exist. Whatever additional spatiality the 5.0 environment adds seems counterbalanced by the decrease in quality; my grade for the mono original would probably have been a "C+", so it appears like wasted effort that this one was redone. In late 1995, Disney released a deluxe laserdisc boxed set of Alice In Wonderland. That set included some terrific supplemental features. This DVD doesn't. It gives us a few, but little to raise the pulse. One part of the LD set that ports to the DVD is "Operation Wonderland", an 11 minute and 20 second TV clip from 1951. Although it's little more than a primitive version of today's featurettes - otherwise known as "glorified trailers" - I enjoyed the piece simply because it provides a little behind-the-scenes action from the Disney studios. Whereas this kind of material seems like nothing special for new movies, since we're so inundated with it, when it comes for an older film, it becomes much more delightful, simply because so little similar stuff exists. The emphasis remains largely promotional in this program, but it's quite entertaining nonetheless. Two "Disney Sing-Alongs" appear on the DVD. These show the respective scenes from the movie and accompany the tunes with lyrics at the bottom of the screen; the words show highlighting to indicate what to sing. We get "The Unbirthday Song" and "All In the Golden Afternoon" in this segment. This feature did absolutely nothing for me. A few other "Gold Classic Collection" staples round out the package. We find the film's theatrical trailer - actually one for a reissue of the movie - plus a "Read-Along Storybook" that reiterates the plot for the kiddies as they follow the text. Finally, a simple 16-question trivia game completes the package. These games are all quite easy, but here's a way to make them a little tougher: only read the answers when a question appears. You can still figure out the correct response pretty quickly, but it's a bit more of a challenge this way, especially because every once in a while, they toss in an alternate answer that fits within the context of the film. It's that time again: here come my standard comments about some of the other aspects of this and other Disney DVDs. (If you've been down this road before, feel free to jump to the final paragraph - I don't mind!) Alice continues the questionable trend we now find on most of their product: a slew of advertisements that appear prior to the main menu. The DVD starts with the usual copyright warning, and then it launches immediately into an announcer with his usual "Coming soon to own on video and DVD..." line. We find ads for the Disney Gold Classic Collection as a whole plus promos for The Little Mermaid II, The Tigger Movie and Toy Story 2. I don't particularly mind these ads; they offer some potentially interesting information and my Panasonic players allow me to quickly and easily skip them through the "chapter skip" button. However, many others detest these trailers; some feel that way just due to the principle of the thing, whereas others have had a trouble bypassing the commercials as easily as I could do so. It appears some DVD players have more difficulty with them than others, though I haven't heard of any concrete trends that indicate any particular models that all refuse to advance. Whether these ads are a serious negative or just a mild nuisance is up to you, but be warned that they're there. At this point, I've started to hate the stupid things just because so many of the DVDs have the same ads; this is almost the same lineup we saw three months ago on The Aristocats, and it's varied little since then. C'mon, folks - shake up the roster a bit! A more positive feature appears on this and other Disney "Gold Classic Collection" DVDs. According to Disney, they're supporting the DVD with a 30-day money-back guarantee; if you don't like the DVD for any reason, they'll refund your cost. I have no idea how easy or difficult it'll be to do so, but I thought this made for a nice gesture. Some drawbacks to that offer exist. For one, there's a limit of $23.49 that you can receive, so if you paid more than that, you're out of luck. Also, the forms indicate that "store cash register receipts must emanate from the same state as the consumer address." That's nuts! That excludes most of the folks who buy their DVDs online - which probably was the intention - but also may affect those who live in areas that intersect closely. For example, I live in Virginia but I work in Maryland, which is all of five miles from my apartment. If I stop by a store on the way home from work and grab a Disney title there, I'm out of luck in regard to this plan because I don't live in Maryland. What difference does it make in which state the person bought the DVD? As long as the receipt backs up the purchase, it shouldn't matter. Why complicate something intended as a public relations gesture? An (apparently) more clear-cut positive comes from a $5 rebate that previous owners of Alice can receive if they buy this DVD. If you send in your receipt and proof of purchase for the DVD with the proof of purchase from your prior copy of the film plus the certificate that comes with the DVD, you can then get $5 back from Disney. Because this DVD of Alice In Wonderland almost completely omits the supplements that appeared on its last LD issue, I can't call it a complete success, but I like it nonetheless. Yes, I'm in the minority, but I find Alice to be a very entertaining Disney film; it's funnier and quirkier than most, especially for its era. The DVD offers very good picture plus decent though mildly flawed sound and a few minor extras. A more comprehensive supplemental section would make my recommendation easier, but even as a fairly basic DVD, I still encourage fans of Disney animation to give this one a whirl.